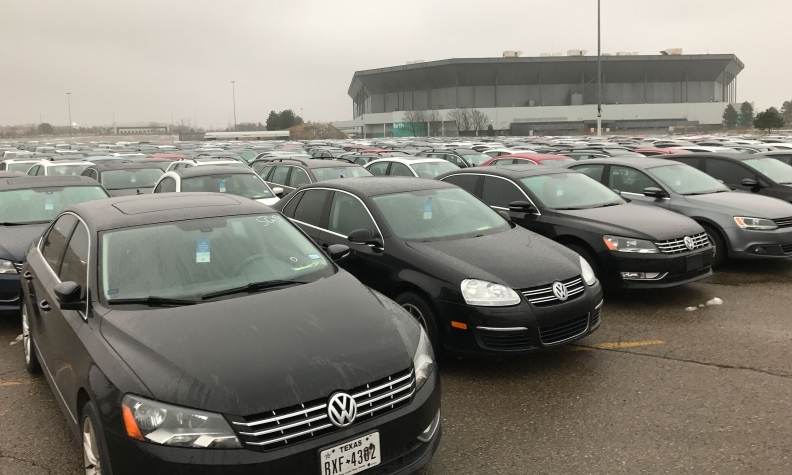 A Canadian-owned business is accused of unlawfully storing thousands of Volkswagen diesel models in the parking lot of a dilapidated NFL stadium outside Detroit. The City of Pontiac, Mich., has filed a lawsuit against the Detroit-based Triple Investment Group, which owns the crumbling Pontiac Silverdome, about 50 km northwest of Detroit. The vehicles are being stored there after the automaker bought them back from customers as part of a settlement in the diesel emissions scandal. Triple Investment Group is a subsidiary owned by Triple Properties of Toronto. The Silverdome, the former home of the NFL’s Detroit Lions and host of countless monster truck shows, is in violation of Pontiac’s building and safety codes, zoning ordinances and municipal code, in part for the storage of used cars on the lot, according to charges filed this week. The complaints, first reported by the Oakland Press in Michigan, were filed against Silverdome owner Triple Investment Group in the 50th District Court of Pontiac. One of the zoning ordinance violations includes not having the necessary permit to park or store vehicles on the outside of a building. VW said it is confirming with its “service provider” that all permits which allow the vehicles to be stored at the Silverdome are up-to-date, per their contract, a VW spokeswoman told Automotive News. As part of a sweeping settlement with U.S. regulators over widespread emissions violations, vehicles equipped with VW’s 2.0-litre TDI diesel engines have been repurchased from owners, removed from dealerships and stored at regional sites. Vehicles which aren’t modified will be recycled. The company said it’s removed about 25 percent of 475,000 2.0L TDI vehicles from the road in the nearly fourth months since the buyback program began. VW pleaded guilty this month to felony counts of conspiracy, obstruction of justice and introducing imported merchandise by means of false statements for its emission-cheating devices. Seven VW executives have been indicted because of the emissions violations.